Add contemporary flair and functionality to your outdoor patio with this folding counter height table. This patio table adapts to nearly any railing, with vertical and horizontal fine-tuning, and can be easily folded shut when not in use, maximizing your patio space. 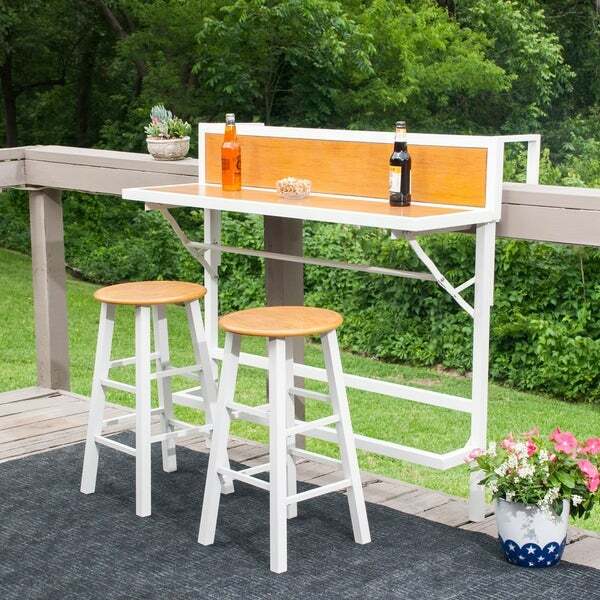 Finished in a fresh white finish that contrasts the painted wood grain, this 3-piece balcony bar set will help make the most of your outdoor entertainment space, no matter how small. Set cannot stand alone and is not wall mountable. Harper Blvd furniture brings homes together with curated looks that fit your lifestyle. Dimensions 20.0 In. X 48.0 In. X 42.0 In. Wow, so the details here if not carefully read make it seem like it is wood. But it’s cheap aluminum painted with wood look. I give one star because the instructions were hard to understand, and the product itself was absolutely cheap. It is almost borderlinging the quality of those cheap canopies you buy, but a hair stronger. I wouldn’t doubt I have to return this thing in a week. I was missing one big screw, some of the holes for the screws were all off making it sloppy looking, and another screw hole was drilled at an angle so the only way to screw the screw was at an angle. This is very poor quality and I would not recommend it at all. I do like the look, just wish it was better quality and more sturdy. it's so unique! never seen anything like it. And,, the price was not too bad. I hope it fits my patio. Safavieh Outdoor Living Griffen Balcony Dining Cabinet Set - Natural - Chair: 14.9" x 23.3" x 31.9"